We have been helping clients sell and buy homes in Arizona since 2006 and we will be excited to add you to our list of happy clients! On our site you may search for homes for sale, to lease and learn more about selling or buying a home. Be sure to download our MOBILE APP so you have accurate real esate information on the go! Any questions just give us a call we will be happy to assist you! Make it a great day! I am the Designated Broker at Quantum of Arizona, REALTORS and the team leader for The Patterson Real Estate Group. 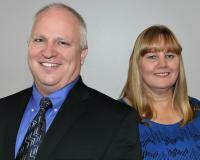 My wife Donna and I started our company in 2009 and have been growing ever since. You know people don't talk about it a lot. But finding the right real estate professions can be the difference between a happy, stress-free home buying or selling experience, and an unhappy, stressful experience. You'll want an professional who is full-time, has a depth of experience, and embraces the convenience of technology without losing the personal touch. "Our experience with both David and Donna was absolutely amazing! David negotiated all the finer points and walked us thro ugh document signing with expertise and grace while Donna just wowed me with her enthusiasm for our purchasing needs. After meeting with Donna the first time, it only took looking at three houses to find our Forever home. I have already recommended David and Donna to my sister for her future purchasing needs. They both went above and beyond to ensure a smooth process, all the way through closing and after. So happy to have been fortunate enough to have them both as our agents"
We would be excited to be able to help you sell and and or buy your new home! Accept nothing less than excellence.